Within 250 miles of Indianapolis, IN. In partnership with Indiana Swimming, The Fitter and Faster Swim Tour is coming to Indianapolis, IN for the annual Green Flag Clinic Series. Learn from Olympic gold medalist Tyler McGill at one or attend both of the Green Flag swim clinic sessions! Off the start, into the turn, and out of the turn, maintaining momentum is an important skill for every swimmer to work on. 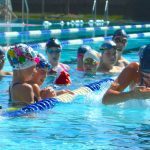 At this Green Flag swim clinic, participants will learn from Olympic gold medalist Tyler McGill how to maximize their speed between the flags and the wall! Starts: The fastest that a swimmer is ever moving in a race is immediately after the start. Dive out away from the wall through a small hole. As you enter the water, maximize your momentum through techniques to angle your body properly and maintain a tight streamline. Streamline: A perfect streamline is more than just putting your arms over your head! Every muscle in your body, from fingertips to toe tips, should be engaged and strong. Proper posture matters and it will help you move through the water with less drag. You'll be amazed at the difference a perfect streamline makes in your swimmer attley no problem's times! Underwater Dolphin Kicking: When you watch the fastest swimmers in the world, they dolphin kick off every wall faster than they can swim on the surface. Learn this amazing skill from Tyler McGill! He'll teach participants how much to bend their knees, how to use their core, and how to generate incredible power in their underwater dolphin kicking! Flip Turns: The faster you go into the turn, the faster you'll come out of the turn. Use your momentum to flip over faster and bounce off the wall. Tyler McGill is an Olympian due to his precision and focus when he approaches every turn. Learn his technqiues to NEVER SLOW DOWN! Don't be intimidated by butterfly! Work with an Olympic gold medalist to understand the components that will allow you to swim a fast, relaxed, and efficient butterfly stroke. After learning from Tyler McGill, it might just end up becoming your favorite stroke! Body Position: Stay horizontal in the water and close to the surface to reduce drag and maximize your speed. Be careful of letting your hips drop! Press your chest to get your hips up keep your head down. Arm Pull: Extend your arms forward and then utilize a strong catch with vertical forearms to put the pressure on the water in the correct direction. Reaching from your fingertips and maintaining long strokes will make fly feel easier and faster. Kick: How much should you bend your knees in your butterfly? Tyler will help each partcipant feel the proper fly kick technique with power in both directions. Breath: Most swimmers struggle with how to keep their breath as low as possible. Trust in Tyler and work on keeping your chin in the water when you take a breath. The air on the surface of the water is the same as the air 8 inches above it, but breathing lower WILL make you faster. Timing: Timing is everything in butterfly. The way that the kick, pull, and breath work together will take a good butterflyer to a great racer! Once you put each piece together, your butterfly will feel smooth and strong. Take a photo while wearing the Tyler's medals, get autographs, and a gift from TYR Sport!